(T)he sidewalk must have users on it fairly continuously, both to add to the number of effective eyes on the street and to induce the people in buildings along the street to watch the sidewalks in sufficient numbers. Nobody enjoys sitting on a stoop or looking out a window at an empty street. Almost nobody does such a thing. 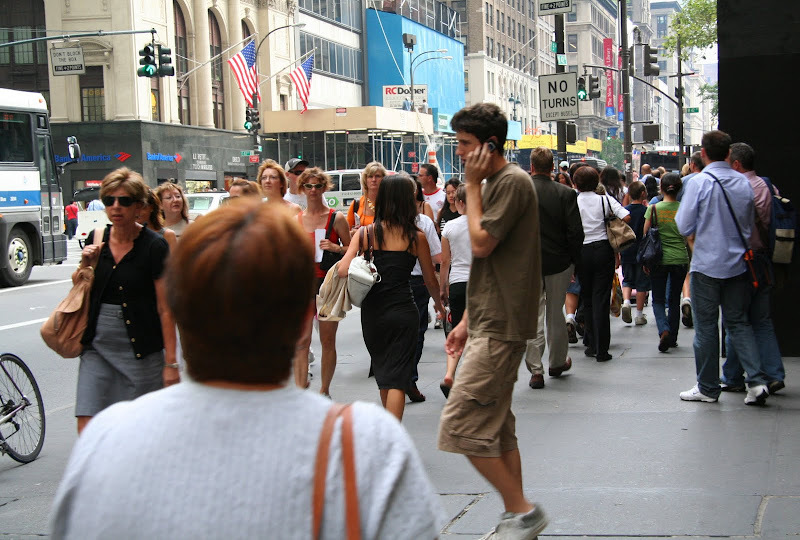 Large numbers of people entertain themselves, off and on, by watching street activity. For the Amish, everything is a ritual. Doing the dishes, mowing the lawn, baking bread, quilting, canning, hanging out the laundry, picking fresh produce, weeding - no distinction is made between the sacred and the everyday. 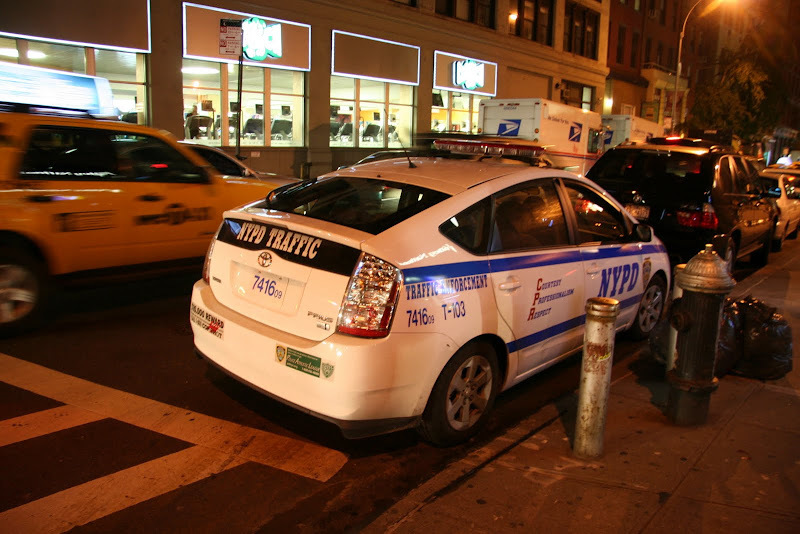 I just snapped this picture on friday before I knew tt was traffic, I was taken with the fact that the nyc traffic cops are driving hybrids! 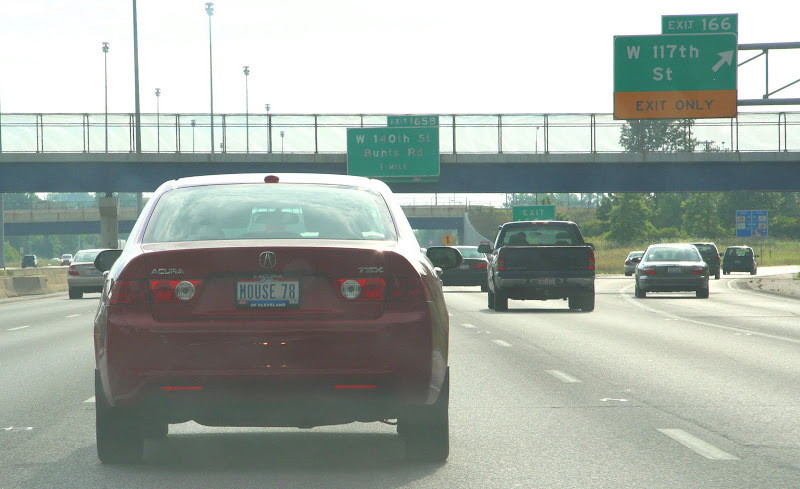 finding vanity plates is one of my guilty pleasures and if I have my camera I have been known to capture the plate. a couple weeks ago I decided I should finally start organizing the snaps I've taken - yet another flickr set! I (heart) flickr! of course I chose a song by traffic! a group I adored back in the day. choosing which song was hard, I finally settled on freedom rider only because it makes for a better post title - although 40,000 headmen was a close contender. lovely quotes today. your post had a calming effect on me, quite the opposite of sitting in traffic. ha. love the pic of the buggies. and the sheep. lol. i'll take your traffic any day kimy. Heh, heh! 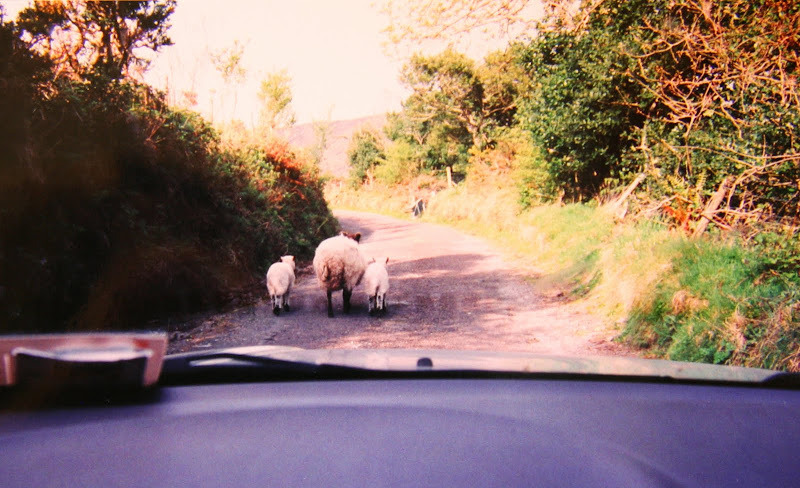 The Amish buggies and the sheep in the Irish country lane are definitely going in the same direction I decided to go in. Great shots, Kim. You know, considering the plethora of Traffic videos showing up today (yup, I'm guilty, too), maybe we should have emailed Winwood, Mason, Capaldi, and Woods and invited them to join in. Hmmm the Amish and the sheep are much more appealing when surrounded by cars and crowds! Great pictures. I saw Amish when I was in Belize. Some of them migrated down there and it's the same set up as in Ohio or PA. They're all good, but I love the pic of the sheep & the caption below it. I liked Traffic "back in the day" as well--hadn't listened to them in ages. That was a great interpretation of this week's theme. Loved it. And I enjoyed the video. I loved Stevie Winwood in the early days. Love the photos and quotes. The Ellen Degeneres one really hit me. Happy TT. Ellen is spot on as usual. I loved your photos and commentary and I wish your newly married friends much happiness. That first quote is so true . .although I'm not driving a car I can't afford. It's a bomb! Someone stole my Honda ensign this week! I guess a 16 year old emblem is worth something! Excellent quotes. I (heart) Ellen! Off to look at the plate collection! Loved the photos as usual. Especially the Amish, sheep and your vanity plates. "Traffic" is one of my all time fave bands! Dear Mr. Fantsay...la la la. Love Stevie Winwood! Great collection of quotes and pics. These are wonderful. Each one deserved its own post, really. In fact, what a great idea for a "theme" blog. I want to live like the Amish, but I fear that typical American existence described by the first picture. We just sold our American house today -- which we only lived in for a year. For the money it cost us, we could have rented a mansion in NYC for a year. GRRRrrr. your photo collection dazzles me! And I always find some gem of a quote! HAPPY TT! (i,m late! 'got stuck in traffic........! )Great Photos as usual.